Harry Piel's life started almost adventurous. After school he committed to serve as a cadet on the sailing ship "Grossherzogin Elisabeth" for seven months, at the age of 19 he went to Paris in order to become a stunt flyer. There he met the director Léonce Perret, who arranged a meeting with Gaumont. There he wrote his first script and the thought to place his future occupation at the new medium film took shape. Already in 1912 Harry Piel founded the "Kunst-Film-Verlags-Gesellschaft" and he realised his first movie as a director with "Schwarzes Blut". Even though the movie was successful, his company went bankrupt a little bit later. But Harry Piel had become established as a film worker. In the following years he shot movies for different companies and soon the action film tourned out to be his passion - "Der Triumph des Todes" (12), "Ein Millionenraub" (14), "Die grosse Wette" (15), "Die Abenteuer des Kapitän Hansen" (17) and "Die Krone von Palma" (18). In 1919 he acted for the first time as a leading actor in the movie "Der grosse Unbekannte". As a director he had the nickname "Dynamite director" because of all the exploding bridges and houses in his movies. These explosions were very often real because he knew a bomb craftsman who constantly informed him about forthcoming blowing ups. Harry Piel caught this explosions with his camera and slipped them in his next movies. With his appearances in front of the camera was also born the sensation-actor Piel who liked to give to understand, that he carried out all his stunts himself. The fact is that the most dangerous stunts were carried out by Hermann Stetza between 1919 and 1924. The transition to the sound film he managed easily. He directed till 1939 successful movies like "Schatten der Unterwelt" (31), "Jonny stiehlt Europa" (32), "Ein Unsichtbarer geht durch die Stadt" (33), "Der Dschungel ruft" (35) and "Sein bester Freund" (37). But than Harry Piel was strucked by the political confusions. His production company "Harry Piel Film Co." - founded in 1921 - was liquidated through the nationalization and after the war he was sentenced to prison for six months by the English court and they also imposed a working prohibition on him till 1949. His delict: hanger-on of the NSDAP where he was a member since 1933. But beside this condemnation the fact that 72 negatives of his movies, among them nearly all his silent movies, had been destroyed during an air raid have him no end of trouble. Harry Piel succeeded in 1950 once more to found a production company, but he couldn't achieve the same success. Early in 1960 he gave up his company and retired from the movie business. 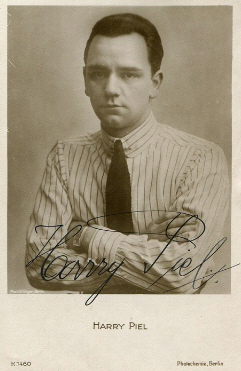 Harry Piel was married in second marriage with the actress Dary Holm.